What's Your Price for Happiness? 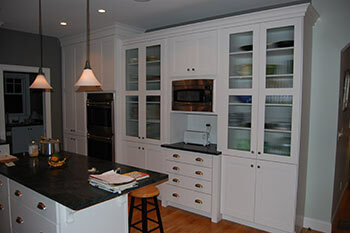 - Wood Palace Kitchens, Inc.
What’s Your Price for Happiness? As I get older, I realize that habit is so hard to change in our lives. We are brought up by our parents’ paradigm to make sure we save money, and we see through those same glasses for the rest of our living days. We all love a good deal until it digs deep into our happiness. I’m amazed at the construction industry and how little the process of sales has evolved over the years. It’s no wonder why the consumer starts off their construction or remodeling projects with a lot of fear in the trust department. Hence the term: What’s your price for happiness? When I started Wood Palace 37 years ago, I was a young 20-year-old with little money saved and ready to take on the world. The late ’70s were a very trying time in our economy. I had saved up $5,000 from my job framing homes, offices, condominiums and in the cabinet shop I worked at later on. I worked every Saturday to make any extra cash that I could. I remember dreaming about owning my own business as I lay there at night trying to go to sleep. The dreams got bigger but the bank account was slow at collecting its nuts. When the time came at the end of ’78 when I finally took the leap at starting my own shop and had to buy the machinery, the dreams had to be set aside. I had only so much money, so the decision of what I was to buy had to be governed by budget. The dream of nice commercial-grade machinery had to be switched to contractor-use ones. I sat there thinking heck, I need these machines so why not save the money on these lesser-priced ones. I sit here looking back at that time of life and the one word that pops in my mind is Pain! It’s true that the shaper machine shaped, the table saw cut, the planer planed and the jointer jointed. What I didn’t realize was that each machine was slow and left saw marks and chip marks, and used more wood material than needed. All this ate up time and money, and left me sanding parts more hours than I planned on spending. It was my first lesson in the world of business: you can’t cheapen the process if you want to profit. I definitely got a lot of practice though on cutting and shaping from that critical lesson. Soon after I learned the hard way, I slowly replaced the machines one by one with dependable commercial-grade machinery. Yes, I paid a lot more for them but the dream became bigger than my thought of budget. Parts of cabinets came out nicer, cleaner and much faster. This equated to getting more done more quickly so that we could do more kitchens in a week. All of us in the shop were happier, our builders were happier, and most of all, the clients were thrilled with the fine craftsmanship at much-reduced lead times. We eventually went from a very small outfit to a multi-million-dollar business per year. Life will go much easier, I have learned over the years, if we dream first and then work on the budget second. That way we make a better decision on what we purchase. If I didn’t have enough money, I went to a bank to get the loan to make sure I purchased the right thing for me and my situation. I appreciate what I buy more and my life goes along much happier and smoother. I’m always amazed at how much dream I can fit into my budget when I do my buying decisions in that order. Don’t shortchange those dreams that you have had in your head for some time. If you choose the right business and salesperson, they will listen to those dreams and help them come to fruition with you. I work hard for my money, and I’m sure you do also so make sure that you give the time and attention that you need to make the right purchasing decision that you deserve. Life is too short not to be happier more often than sad and frustrated. Dream first and I guarantee that happiness will always be the end result. If you would like a copy of my book, Dream First, go to www.woodpalacekitchens.com and download your free copy. This entry was posted in Inspiration on January 14, 2016 by THblog. Solid Surface vs QuartzTransitional Style; The New Traditional Look?